Another great way to pack a quick lunch is to use a Thermos. Everyone enjoys a warm lunch now and then. I have used my Thermos quite frequently throughout this school year. 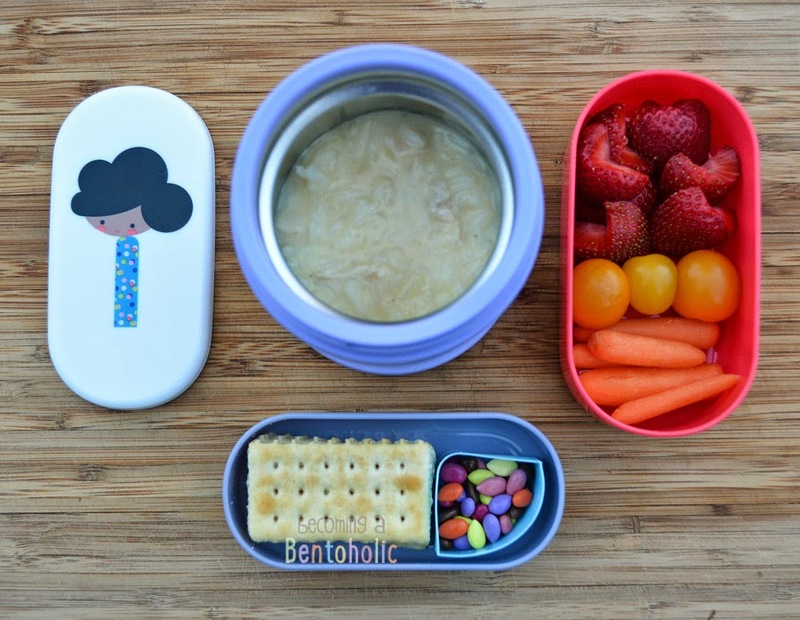 When I pack a Thermos / bento lunch combo I usually pack the sides the night before and pre-portion out whatever it is that I am planning on sending in the Thermos (in this case soup) in a separate container. A little pre-planning makes the morning go a little smoother. A tip to keep food warm a little longer - boil water, pour into Thermos, and let sit for at least 5 minutes. Warm the food you're planning to send in the microwave or on the stove and pour it in to the warmed up Thermos. In this lunch: Avgolemono soup (a Greek soup with chicken, rice, and lemon), strawberries, yellow cherry tomatoes, baby carrots, club crackers, and chocolate covered sunflower seeds.